Join us THIS Friday, April 26th at 7pm for a POWERFUL night of Worship with Triumph Worship! It’s going to be a night of breakthrough, so come jump into the overflow! VOT’s Healing Rooms are Launching! Voice of Triumph is launching VOT Healing Rooms in April! Our desire is to bring in the regions and see the supernatural power of God bring physical freedoms and breakthroughs in individuals! If you’ve gone through our Healing Training, or have experience in other Healing Rooms and would like to join our team, please contact Bill George for more info! Join us this Sunday for the final teaching of 401 after Sunday’s Service!! Create 28 Home Group Launches NEXT Month! VOT is launching Create 28 to foster creativity within community! Everyone carries an expression of God’s creativity in them - don’t count yourself out! Create 28 will be going through Theresa Dedmon’s curriculum in order to cultivate a greater understanding of God’s creative heart for you! 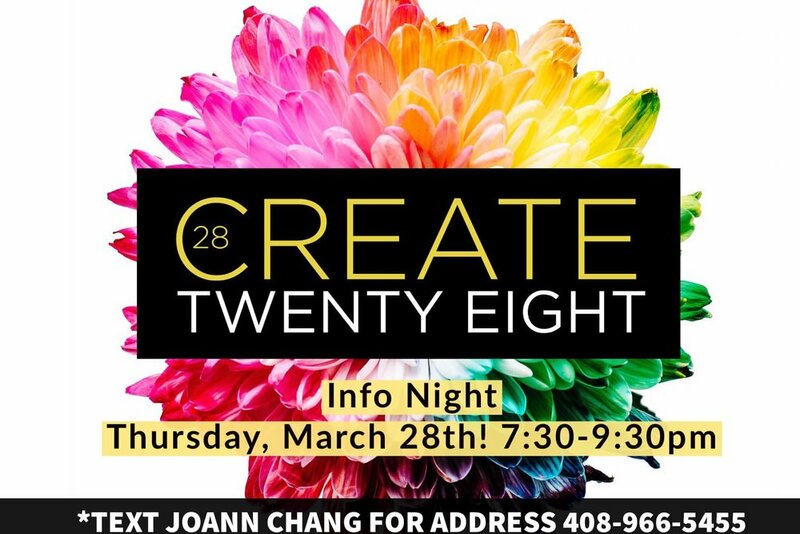 Join us for a Create 28 Info Night on Thursday, March 28th at 7:30pm! We’ll gather together over a potluck dinner! Bring a friend! Come out Wednesday nights and pray with us! You’ll leave encouraged, refreshed, and stirred to continue walking out who you are in Him! 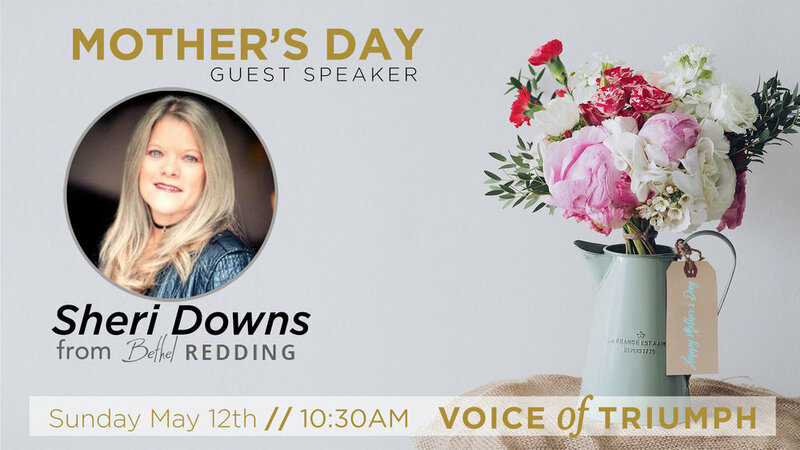 Sheri Downs from Bethel church in Redding will be guest speaking on Mother’s Day! Voice of Triumph invites YOU to come and celebrate the resurrection of King Jesus with us! We are expectant for encounters through our live worship, and a powerful Word, too! Don't forget we will also have an awesome kids ministry lesson & activity, a photo booth, a 3,000 Easter Egg Hunt, AND a fun kids raffle with great prizes! Make sure to join us and bring your family, friends, and neighbors along with you! Women’s Connect with Guest Speaker Nancy Vuu! Join us for a great word, and great fellowship! We will have guest speaker, Nancy Vuu, Fashion Designer/Creative Director Photographer at Nancy Vuu Production & Design. She is bringing the Kingdom to fashion and entertainment influencers! Don’t miss out on catching what she carries! Come be part of VOT’s Easter Outreaches! Easter is an amazing celebration of the resurrection of King Jesus and we want YOU to help us share that message! Come and join us as we hit the streets of Fremont to evangelize and invite our community to our Easter Service! 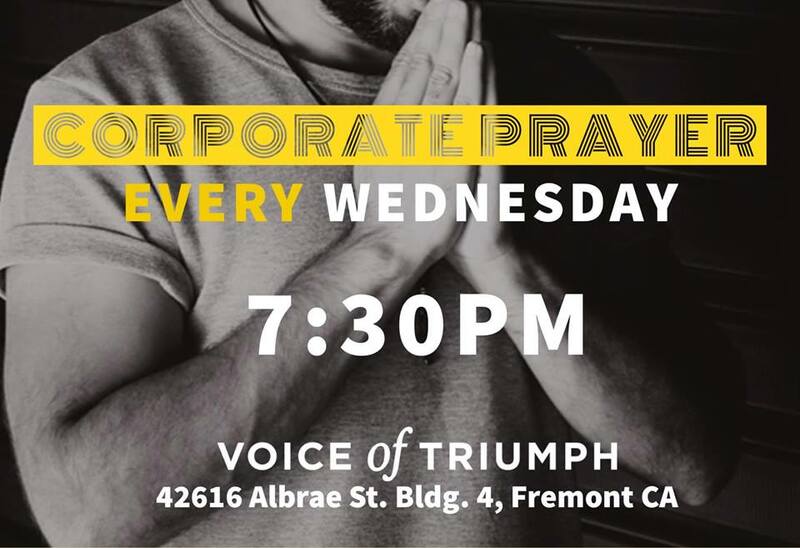 **HANDS ON: Meet us at Voice of Triumph at 10:30am to gather and pray before we go out into the City of Fremont! **SOW INTO: Partner with us financially to bless the Southlake Community’s Easter Egg Hunt! 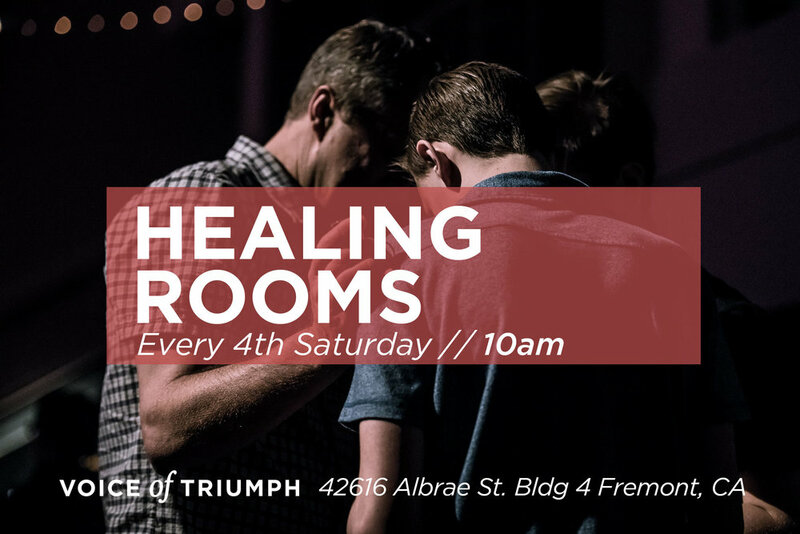 **Meet us at Voice of Triumph at 10:30am to gather and pray before we go out into the City of Fremont! 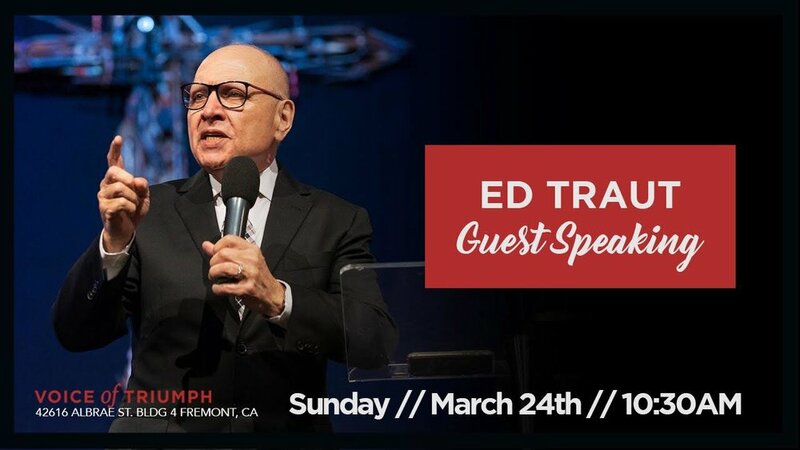 Ed Traut will be guest speaking at Voice of Triumph back to back! Come out for an incredible time of God’s power and presence! Family Fellowship invites you and your kids to come and be part of this amazing community that’s desire is to ‘do life together’. We jump into the heart of God through His Word, and fellowship over dinner! We can’t wait to see you! Growth Group is a community that dives deep into the Word of God, together! If you’re looking for community, or if you’re looking to get equipped and rooted in His Word, this is for you! Voice of the Prophets: There’s Still Time to Join! Voice of the Prophets has been amazing so far AND there’s still time to come be part of this amazing community! Come and join us for a practical equipping on prophecy, as we prepare to launch Voice of Triumph’s Prophetic Rooms to encourage and release Heaven over this region! This Training is FREE! Just grab a workbook! Join us for this free event in Fremont on Friday for this Bay Area Wide Event with amazing speakers Richie Seltzer and Marti Souza at Voice of Triumph!! All Bay Area Conference with Joaquin Evans, Blaine Cooke, Richie Seltzer, Joanne Moody and Bethel Worship at Harbor Light Church in Fremont! Join us for a life transforming time along with our and Bethel Worship. There is a renewed interest in Jesus that is being birthed in the Bay Area. People's live are being radically changed. You will be trained by leaders who will equip you to testify and release the love of Christ into every area of your life. You will learn practical skills, grow in boldness birthed by compassion and receive an impartation for healing and declaring the good news of the gospel. VOT is launching the beginners training of our Voice of the Prophets training classes! We all have the ability to hear God not only for ourselves, but for others! Come and join us for a practical equipping on prophecy, as we prepare to launch Voice of Triumph’s Prophetic Rooms to encourage and release Heaven over this region! This Training is FREE! All you’ll need to do is purchase your workbook! Dr. Mike Hutchings is part of Global Awakening alongside generals like Randy Clark! Dr. Mike has a great transformational anointing, not just for churches and regions, but he also carries a great anointing for healing of traumas and PTSD. You are not going to want to miss this! Come and join us NEXT Saturday for our Women’s Connect Brunch with guest speaker Pastor Ida Hardy! Bring a friend along with you as we get ready to experience God’s empowerment through an incredible Word and community! See you there! Let us know you’re coming by clicking “going” on our event page!